A3, A4, A5, Executive, Folio, JIS-B4, JIS-B5, Ledger, Legal, Letter, Oficio, Statement and Universal paper sizes are supported for card stock and various plain, recycled or bond papers in this tray. Tray-present, paper size, paper-present and paper-low sensing are supported. 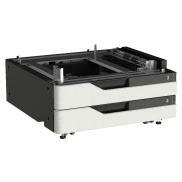 Installs below the MFP or printer and raises it to the correct height for use with a Finisher. Tray-present, paper size, paper-present and paper-low sensing are supported. A3, A4, A5, Executive, Folio, JIS-B4, JIS-B5, Ledger, Legal, Letter, Oficio, Statement and Universal paper sizes are supported for card stock and various plain, recycled or bond papers in this tray.